PACIFIC OCEAN (NNS) - USS Nimitz (CVN 68) took on more than 900,000 gallons of 50-50 biofuel in preparation for the Navy's Great Green Fleet demonstration, July 18. The fuel will be used for aircraft and other naval surface ships to reduce U.S. dependency on foreign oil by blending traditional petroleum-based fuel and biofuel made up of a mixture of algae oil and waste cooking oil. "There has been a lot of rigor in our Navy to try to test bio fuel and see how we can be more efficient in terms of how we operate our engines and aircraft," said Rear Adm. Peter Gumataotao, commander Carrier Strike Group 11. "If the biofuel works it can potentially increase our legs in combat maneuverability in terms of our ability to fly longer and sail further." 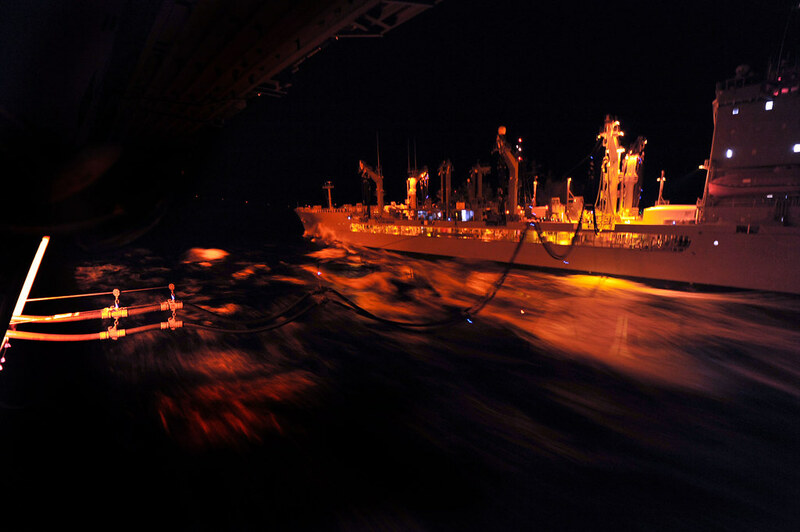 Nimitz received the fuel delivery July 17, from the Military Sealift Command fleet replenishment oiler USNS Henry J. Kaiser (T-AO 187) using connecting fuel hoses between both of the ships. The fuel will be tested for accuracy and similar properties as unblended fuel in the ship's fuel laboratory. "This is the last step," said a representative from NAVAIR. "To make this Great Green Fleet possible with the expertise of these sailors, [this evolution] will not be a problem." The Great Green Fleet demonstration will be attended by the Secretary of the Navy the Honorable Ray Mabus and Chief of Naval Operation Jonathan Greenert. "It's more than biofuel when you talk about energy efficiency," said Gumataotao. "The bottom line is [the fuel] improves our combat capability and improves the way we fight." Nimitz is currently underway for participation in Rim of the Pacific (RIMPAC) 2012. RIMPAC 2012 is the 23rd exercise in the series that began in 1971. Twenty-two nations, more than 40 surface ships and submarines, more than 200 aircraft and 25,000 personnel are participating in the RIMPAC exercise from June 29 to Aug. 3, in and around the Hawaiian Islands. RIMPAC is world's largest international maritime exercise and provides a unique training opportunity that helps participants foster and sustain the cooperative relationships that are critical to ensuring the safety of sea lanes and security on the world's oceans.